Focus on six different aspects of U.S. geography (rivers, bays, lakes, mountains, cities, and states). Each worksheet is set up for students to complete independently and at their own pace. ♥ Engaging and clear activity. It was actually a really great task to leave with a substitute (though I would have rather have done it with my students, myself!) - but that's how clear and easy to follow it was! ♥ This really helped with my geography unit. Students enjoyed how they were able to label on their own and then reuse it as study tools. Thanks! ♥ Great activity for beginning of the school year to review map skills. 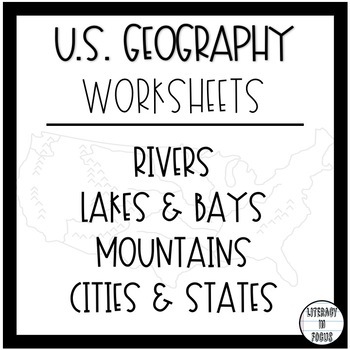 ♥ Easy to use for a quick review of major landforms and cities. 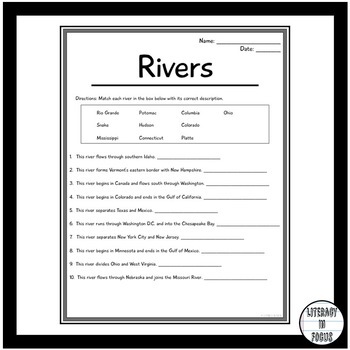 U.S. Rivers Worksheet: This worksheet requires students to match ten different U.S. rivers with the correct description. Students will need to have access to the internet or another geographical reference to complete this worksheet. U.S. 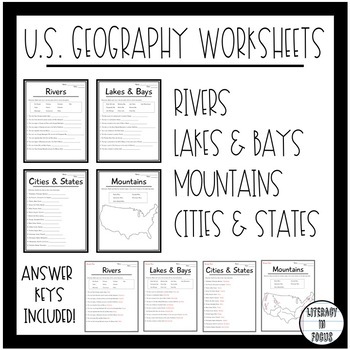 Lakes & Bays Worksheet: This worksheet requires students to match ten U.S. lakes or bays with the correct description. Students will need to have access to the internet or another geographical reference to complete this worksheet. U.S. Cities and States: This worksheet requires students to identify fifteen U.S. states based on three large cities listed for each state. Students will need to have access to the internet or another geographical reference to complete this worksheet. 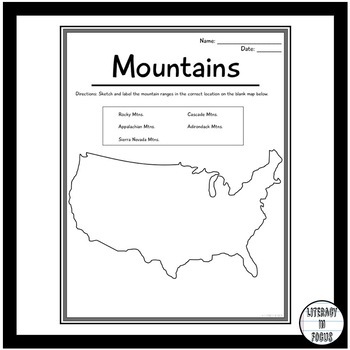 U.S. Mountain Ranges: This worksheet requires students to sketch and label five specific U.S. Mountain Ranges on a blank U.S. map. Students will need to have access to the internet or another geographical reference to complete this worksheet. Answer Keys: An answer key is provided for each worksheet for easy grading or use with a substitute teacher. The 50 States Workbook - Research Pages, Bibliography Template, and Rubric!